In our November issue of the Gifted Matters Newsletter, we discussed the issue of misdiagnosis of ADD/ADHD when the behavior could instead be attributed to common characteristics of gifted children (click here to read that article). In Part 2, learn about the criteria for ADD/ADHD diagnosis as well as the characteristics that distinguish gifted/ADD/ADHD students from others. A diagnosis of ADD/ADHD has become increasingly common according to the Centers for Disease Control and Prevention (CDC). According to a survey conducted by the CDC, “The percentage of children with a parent-reported ADHD diagnosis increased by 22% between 2003 and 2007.” Currently, 8.4% of children age 3-17 years have been diagnosed with ADHD. 4.7% of girls (3-17 yrs) have been diagnosed with ADHD. Are these children correctly diagnosed? In 2012, the CDC released data from a multistate study (Project to Learn about ADHD in Youth “PLAY“) on the diagnosis and treatment of ADHD. The results found that many children who were taking ADHD medication did not meet the definition of ADHD (specifically, only 39.5% in one state and 28.3% in another state met the case definition). While the CDC does not address whether these children were misdiagnosed originally, the point is clear that a majority of the children studied should not have been on the medication for ADD/ADHD. There is no indication that the diagnosis of ADD/ADHD will decline. In fact, many experts have voiced concern about further broad criteria in the DSM-V, to be released in May 2013 by the American Psychiatric Association. Click here for more information. A summary of the criteria is provided below. It is easy to comprehend why so many students and adults are diagnosed with ADD/ADHD and why there is a likelihood of misdiagnosis based on these extensive diagnositic standards. Before your child is diagnosed, ensure that your specialist is going to look at the whole child. If you think your child might be gifted, consider someone who is an expert in giftedness and ADD/ADHD. Additionally, the person conducting the evaluation should look to the child’s true peers when assessing the appropriateness of their developmental level. There are, of course, children who are correctly assessed as both ADD/ADHD and gifted. Deirdre Lovecky, in her book, Different Minds, outlines some of the differences between students who are twice exceptional (2e) and their peers. 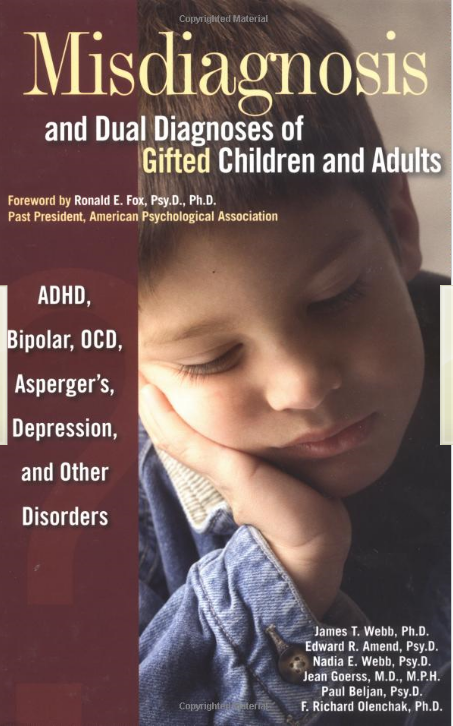 “[Many experts on giftedness] are of the opinion that gifted children are incorrectly diagnosed as suffering from ADD/ADHD particularly often.” – Dr. James T. Webb, in Misdiagnosis and Dual Diagnosis of Gifted Children and Adults. Why the confusion specifically regarding giftedness and ADD/ADHD? The line between gifted and ADD/ADHD can be very blurred. For more information on misdiagnosis, please refer to Part 1 by clicking here. I’ve read, reread and loved the book “Misdiagnosis and Dual Diagnoses…”, as well as pretty much everything I can find online about the combination of giftedness and ADHD. Dr. James Webb, for one, seems to be very knowledgeable about giftedness, like Dr. Russel Barkley is in the field of ADHD, but I still have not found any expert on the combination?